The last time I saw YACHT was in 2009 at Holocene, back when they were a duo with founder Jona Bechtolt and new recruit Claire L. Evans. It was a fun show, but they only had a laptop and two microphones. The excitement in their sound was infectious, but it lacked something—there was another energy burning to get out, burning to show itself to the electro-pop world. Adding some musical accompaniment and relocating to L.A. in the years since, YACHT were back in their home town of Portland on Tuesday at Mississippi Studios and brought that missing element to the stage: rock and roll. YACHT’s live performances now include Bobby Birdman on bass and Jeffrey Jerusalem on drums, adding a whole new dimension. The instruments not only make the sound louder, fuller and more organic, but they give YACHT more of a primal danceability. Jerusalem’s drum intro for the opening song “Party at the NSA” (below) set the pace for the entire show. From the very beginning, the audience’s hearts were pounding along with the live beat rather than a drum machine. The additional band members also free Bechtolt and Evans to experiment and take risks with their music. Bechtolt can switch instruments, own center stage, bust out dance moves, twirl the microphone around and beat it all over his body. And for Evans, it allows her to be who she was born to be—the frontwoman. 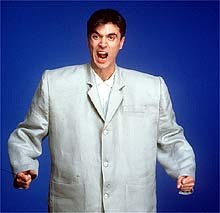 Evans is the female version of David Byrne. She exudes confidence, makes eye contact, and delivers a range of emotional looks while dancing choreographed routines. She even wore a royal blue '80s-style suit with narrow lapels, a skinny and modern reminiscence of Byrne’s baby blue '80s suit in Stop Making Sense. You can’t take your eyes off of her, especially when she’s jumping out into the audience during “The Afterlife,” just the second song of the show. She is spiritually magnetic, radiates power and skill, and like a superb frontwoman, she makes it look easy. Evans shared the front of the stage as Bechtolt took the lead on “Tripped and Fell in Love” and “I’m In Love with a Ripper.” Bechtolt is no amateur frontman himself—he captivated the audience by singing and playing guitar while cutting a rug. One of the show’s highlights was when Bechtolt jumped over the roped-off front row barrier. This caused the audience to knock down the makeshift gate, uniting them as one. YACHT played tunes mostly from their two recent albums, See Mystery Lights (2009) and Shangri-La (2011), with songs like "Utopia & Dystopia (The Earth Is On Fire)" and the mandatory mantra “Psychic City (Voodoo City)” (watch the video below), ending the night with the encore "It's Boring/You Can Live Anywhere You Want.” The audience ate it up as they danced and sang along. A few times throughout the show Evans took questions from the crowd: “How much do you love Portland?” and “What’s up with the Aphex Twin shirts?” But the most interesting was: “What is your favorite mythological character?” Evans directly replied, “Limos.” For someone who is providing so much to the audience, it’s interesting that her favorite mythological character is the goddess of starvation. It’s just like YACHT to be so overtly weird and wonderful. It’s just like this band from Portland to project the dualism of providing a feast while loving the famine.